Lenovo has announced a more budget friendly version of the Moto Z smartphone, called the Moto Z Play as well as a new camera MotoMod in partnership with Hasselblad, ahead of the international IFA 2016 tech fair in Berlin. The Moto Z series was first announced by the company at its Tech World conference in San Francisco this June, and included two premium devices: The Moto Z and the Moto Z Force. The smartphone will cost $408 in North America and 499 euros in the European market. At present the Moto Z Force is a Verizon exclusive device in the US. Moto Z is the semi-modular series from Motorola and has a variety of Mods, which can be strapped onto the back of the smartphone for extra functionality. The Moto Z Play is a new phone at a differential price point from the company, which is pitching phones with Mods as the next level of innovation in smartphones. The new Moto Z Play has a 5.5-inch full HD Super AMOLED display, but a lower Qualcomm Snapdragon 625 processor, coupled with 3GB RAM and 32GB storage space. There will be a dual-SIM option in this as well, along with microSD slot support. Moto Z Play comes with a 16 MP rear camera on its own along with a 5MP front camera. The battery on this is 3510 mAh, which is bigger than the one on the more premium Moto Z. Just like the Moto Z and Moto Z Force — the latter has a shatterproof display, the Moto Z Play also has a Type-C USB connector. But it also has a headphone jack unlike the other two phones, which skipped the 3.5 mm port. In terms of MotoMods, the new edition is called the Hasselblad True Zoom Mod, and Lenovo has collaborated with the legendary Swedish camera maker for this one. The 10x optical zoom with a 4.5-45 mm lens and Xenon flash; it will also let users shoot images in the RAW format, a feature most smartphones don’t support currently. However, the optical lens has not been supplied by HasselBlad, which Lenovo says has helped with the special shooting mode and RAW capability among other things. The mod will be available for $299/€299. 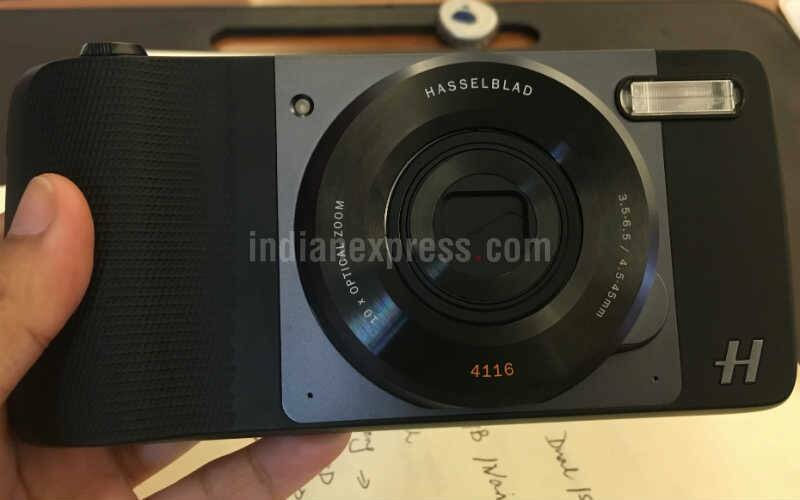 The Mod has Hasselblad branding on it, and its own 13 MP image sensor as well. Moto Z phones will have access to the Hasseldlad editing software as well, although the standard Motorola camera app is used when the module is strapped on to the phone. The Hasselblad MotoMod can be attached to the back of the phone via the 16 magnetic pins just like the other Mods in the series. Other MotoMods in the list include Power Pack, JBL SoundBoost which is a speaker module, and Moto Insta-Share projector, which lets users project their smartphone screen on the walls. 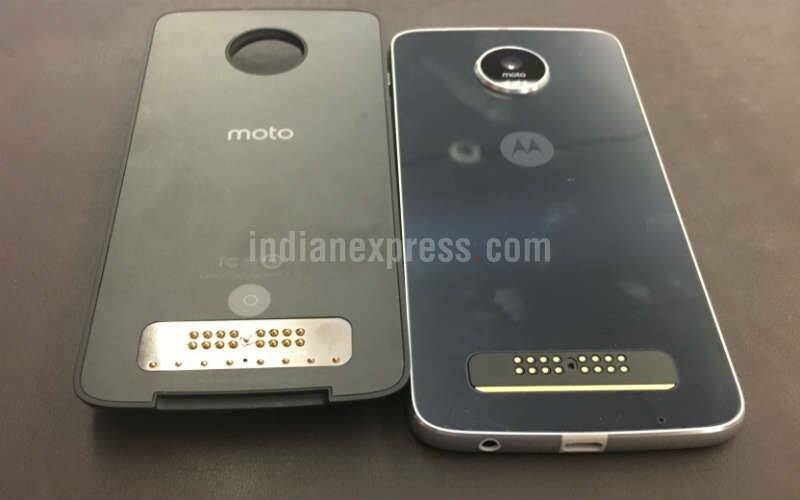 Given the budget pricing of the Moto Z Play, we can expect this phone to make an appearance in India soon. Motorola has hinted in the past that it plans to bring the Moto Z series and Mods to the country, although the original Moto Z smartphone is expected to have a more premium pricing one.